Skydiving Innovations (SI) is an aerial and ground entertainment company that provides aerial shows and team building events using retired and active duty service men and women, as well as civilian professionals. Image courtesy of Ron Lee, Skydiving Innovations. 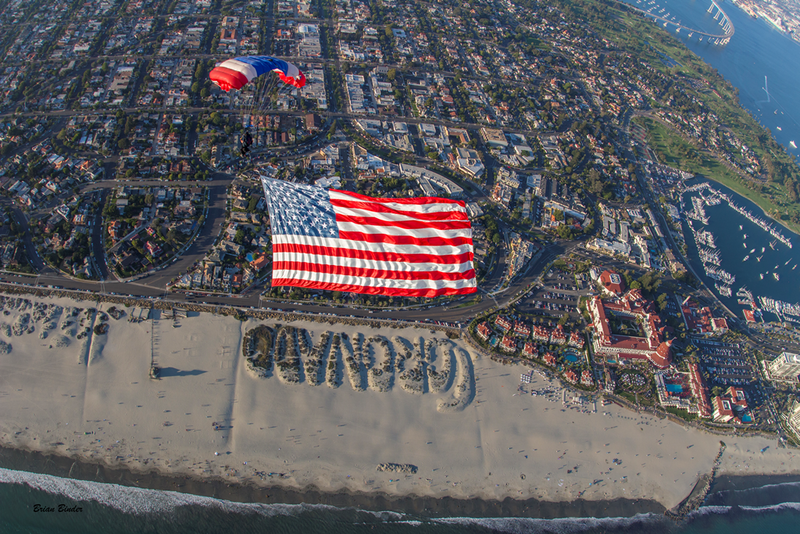 What could be more “Coronado” than Navy Seals skydiving over the Hotel del Coronado, displaying the American flag, over the beach dunes that spell out “Coronado”? I can’t think of anything more quintessentially Coronado. Ron Lee and Todd Lee, co-owners of Skydiving Innovations (SI), felt that too and that’s exactly why they envisioned this event. Wish you had been there to see it happen? Scroll down on the SI website and you can experience the entire landing via Go-Pros that were attached to the helmets of the parachute jumpers. It’s pretty spectacular to watch them land on Del Beach. And if you’re like me, this is closest I’m ever going to get to jumping out of an airplane, over the Del or not. 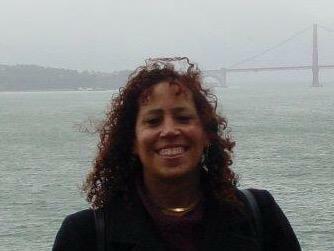 Todd Lee co-owns Skydiving Innovations with her husband Ron Lee. Ron and Todd’s Bonita, CA based company, Skydiving Innovations (SI), is an aerial and ground entertainment company that provides aerial shows and team building events using retired and active duty service men and women, as well as civilian professionals. 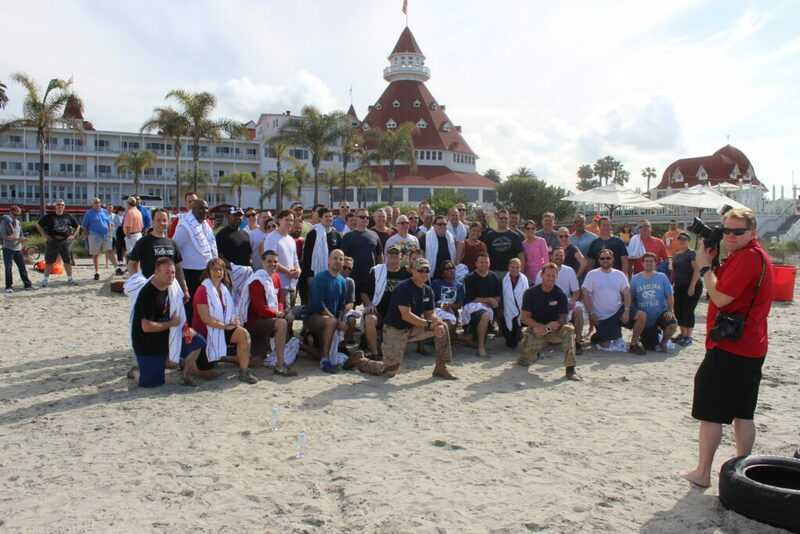 They are the exclusive provider to both the USS Midway Museum and the Hotel del Coronado. Their mission is to provide extra-ordinary experiences for the work forces of businesses, groups, and major corporations. They do this by dazzling employee spectators on the ground or thrilling executives by taking them on a tandem jump. In essence, Skydiving Innovations provides branding for the company logo by connecting the corporation’s brand with this peak experience. For example, instead of the American Flag, eCoronado.com publisher, Steve Johnson, could do a tandem jump with SI with an eCoronado.com flag and then parachute to the ground to greet the writers and editors. Maybe a reception at the Del… I’d be up for that. There are a lot of people who like skydiving and plenty of people who will jump for shows at fairs and concerts simply because of this enjoyment, so I was curious as to how Ron and Todd and SI are now jumping on the Midway, landing on Del Beach, and starring in commercials and film. How did they take skydiving beyond a basic level to create these epic-size productions? Many of us in Coronado understand the power of connection to a life-long community. Some residents’ families have lived on the island for generations. They draw great assurance, stability, and wings from their connection to this beautiful hometown. 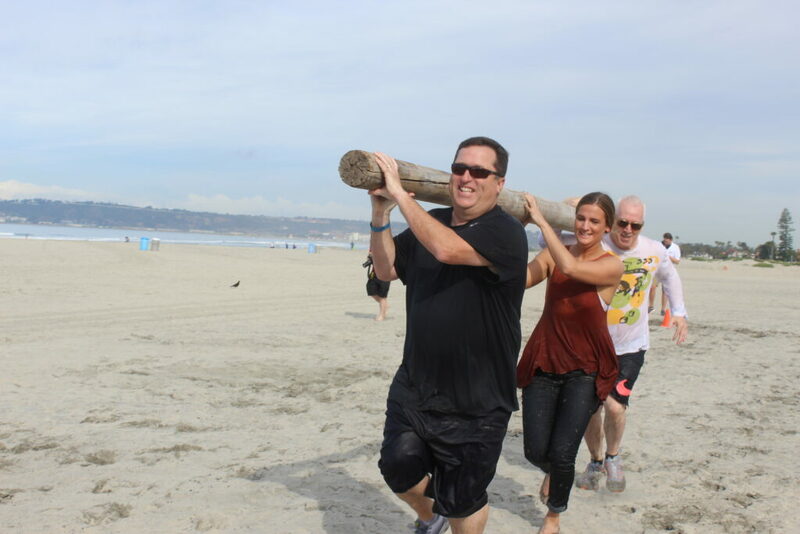 Yet, many in Coronado draw strength from the opposite experience. Navy families, in particular, site the frequent relocations during childhood as something that gave them strength and confidence. 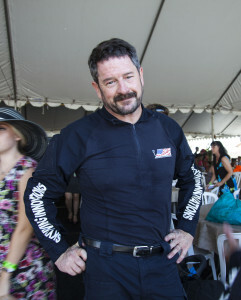 Ron Lee, co-owner of Skydiving Innovations. Ron was not a Navy kid, but he understands the childhood experience of moving often and the benefits it can bring. Ron’s father was a scientist and a researcher whose work relocated Ron and the rest of his family to Canada, Mexico, Guatemala, and England. Ron only spent one year in Japan, his senior year in high school, at the American School in Tokyo, Japan. So like many Navy kids, Ron grew up with an open-mindedness to new experiences. Ron’s first jump out of an airplane with a parachute came from a youthful adventurous spirit. Friends just talked him into doing it. Being an entrepreneur takes a lot of courage and sense of adventure as well. Talking with Ron, I sensed that his entrepreneurial drive also came from this constant moving around the world as a child. After that first jump, Ron went on to create a company that did sky jumps for concerts, county fairs and the like. Ron and Todd enjoyed running their small business, but they wanted to do something bigger; not only financially but also something with greater meaning. Excellence, personal and corporate, is the focus of SI. 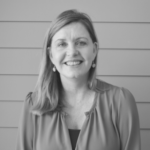 Ron explained that after an SI experience, executives go back to work with the understanding that anyone can be extraordinary, that anyone can persist in valleys, and that excellence is simply a state of mind you adopt. His goal for participants is for them to go back to work inspired and better able to lead their corporate team. 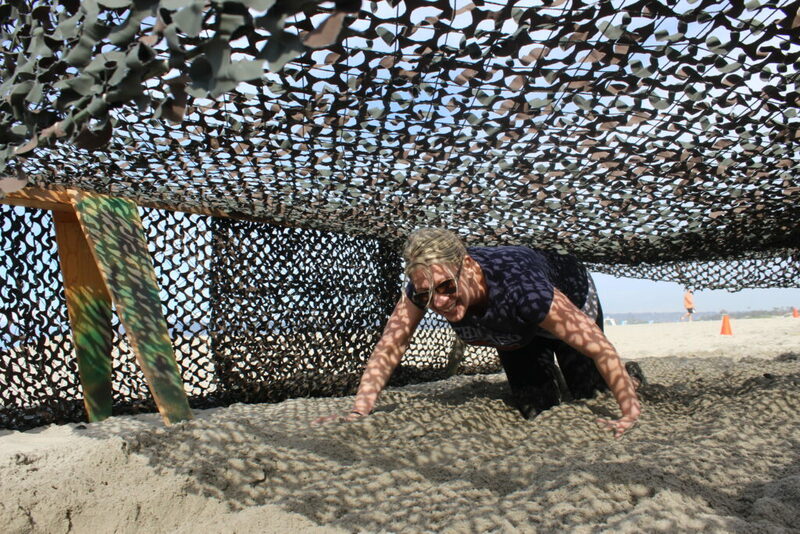 A corporate participant in a Skydiving Innovations “boot camp” races under the net. Importantly, SI has been incident free and accident free for 30 years. This includes not only straightforward events, but technical events such as landing on the Midway docked in downtown San Diego. Ron emphasized that his wife Todd, who runs the ground/safety operations, is the more important person in the organization. If I was going to ever put my life in the hands of a partnership, I’d like them to have worked together for a while. After 38 years of being together and 28 years of marriage, and 30 years of being business partners in Skydiving Innovations, I think we have that with Ron and Todd. In addition to the skydiving events, Skydiving Innovations provides boot camp experiences at corporate events. SI also has a strong philanthropic commitment to the Navy SEAL – Naval Special Warfare Family Services. I don’t think I’ll be jumping out of airplane soon, but Ron’s enthusiasm for his work and his belief that anyone can accomplish any goal with enough commitment and persistence had me entertaining the idea. You can also find Skydiving Innovations on their facebook.com page.